As a PADI Assistant Instructor, you not only gain additional experience as a PADI Professional scuba diver, but you also start learning the PADI System of diver education. You can act as an instructional scuba assistant and assume limited teaching responsibilities. It’s a great way to gain experience in order to become a scuba instructor! Present the knowledge development elaboration for any PADI Diver course under the instructor’s indirect supervision. The instructor personally assesses student knowledge development. Present initial skills training under the instructor’s direct supervision during confined water dives. Conduct open water surface skill evaluations during Open Water Diver course dives under the instructor’s indirect supervision. 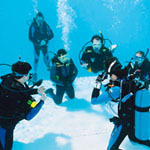 Teach and certify Peak Performance Buoyancy Specialty Divers under the direction of an instructor. Skin Diver and Discover Snorkelling. Independently teach the Project AWARE (nondiving) Specialty course. Independently teach the AWARE – Coral Reef Conservation (nondiving) Specialty course. Independently conduct Discover Scuba Diving in a pool or confined water. Independently conduct PADI Seal Team AquaMissions. Teach and certify divers in a specialty courses that don’t include dives after successful completion of Specialty Instructor Training courses for such specialties. If you wish to make a booking please contact us or feel free to call in to the dive centre for a chat. In addition to all PADI Professional course fees you will need to consider PADI Materials, PADI Registration Fees and eLearning where applicable. View details of all our current course prices. Diverse Scuba operates in compliance with ISO 24803 Requirements for Recreational Scuba Diving Service Providers.